The garment of Sultan Mehmed the Conqueror is one of the very first samples of the precious collection. The garments of all 36 Ottoman sultans will be recreated by trainees at the Konya Technical School for Girls, from Mehmed the Conqueror to Suleiman the Magnificent to Osman I and Sultan Selim I. The clothing will be exhibited in the Kalehan Ecdat Garden of the Konya Metropolitan Municipality. The very first samples of the precious collection belong to Sultan Mehmed the Conqueror and Sultan Abdülhamid II. As the richest examples of Ottoman textiles and fabrics, the recreated sultans' garments began to be made after a detailed study. 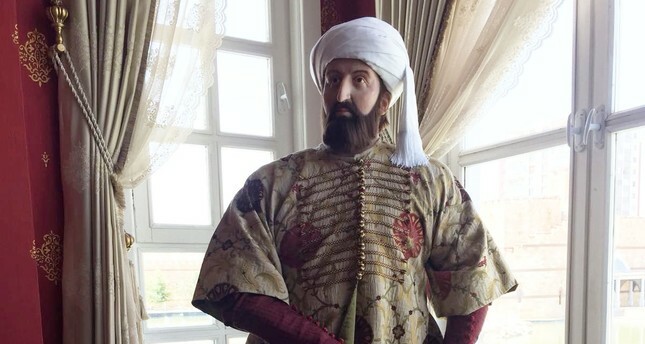 Pieces belonging to the 36 Ottoman sultans and the last Khalifa Abdul Majid will be exhibited on sculptures of the sultans made of silicone by associate professor Mutluhan Taş from Selçuk University (SU) Faculty of Fine Arts. The head of the technical school, Emel Tosun Akmeşe, spoke to Anadolu Agency (AA) and said that they have conducted various studies in cooperation with various institutions to revive traditional culture. Noting that the sultans' garments project is one of these studies, Akmeşe said, "Associate professor Mutluhan Taş from the SU Faculty of Fine Arts makes sculptures. The project is totally designed by him." Akmeşe said that they got really excited upon hearing about the project and initiated it in a short while. Noting that the studies are ongoing and following a strict schedule, Akmeşe said: "Up until now, we completed the garments of Sultan Mehmed the Conqueror and Sultan Abdülhamid II. For the time being, our team is working on pieces for Sultan Suleiman the Magnificent and Sultan Selim the Stern. The collection will be exhibited when all the pieces are completed." Providing information on the creation of the garments, Akmeşe said: "The historical backgrounds of the garments are studied in depth by the research department of our school. Afterwards, the findings are sent to the design department, and sketches are completed there, and last comes the production phase that is conducted in our workshop. The research phase for this project took a really long time. We studied artifacts at Topkapı Museum and conducted research that also covers dissertations. For now, we are waiting for the fabric supplies. We cannot find these fabrics in Konya. We weave them if needed, then we move on to the sewing phase which takes approximately a month." Since the work is challenging but enjoyable, Akmeşe added: "Sewing the sultans' garments is very important for the trainees' improvement. We have to understand the sewing techniques of the time in addition to the accessories, fabrics and details of the garments and reflect them in the newly created versions. Thus, we are developing our capabilities while at the same time completing the project. Garments of some sultans were sewed in accordance to their original versions; however, we are the first as an institution setting out to recreate the garments of all the sultans." Stressing that the research team and the personnel of the design and production departments work successfully as a team, Akmeşe said: "One of the targets of our institution is to study history and to offer insight into the future. Apart from the team working in the food and beverages department, nearly all our friends are busy with this project. We are preparing the sultans' garments with a team of 60 members. From our culture of food and beverage to apparel, we work to present all our traditions to existing and future generations and to make our ancestors known. Setting out with such an aim, we do our best."